Y'all I hope you're sitting down for this one....this could potentially be a llooooooonnnngggg email but I'll try to keep it on the shorter side as to not make y'all fall asleep wherever you happen to be reading this. That would be embarrassing for you. ðŸ™ƒ We will start our story on Tuesday. Tuesday: We had our first district meeting! We discussed what we wanted to improve on and we all decided that we wanted to have more people in church this coming Sunday. We then decided that in order for that to happen, we needed to invite more people to come to church. Our oh-so-inspired district leader had each companionship choose an amount of people they could invite each day. We accidentally chose the V E R Y high number of inviting 10 different people every day of the week to do our part to help increase the number of people in church. Insta-regret right there cause that is so stinkin many!!! But Sister K is a trooper and we went to work. Let's now jump to Thursday. Thursday: We did weekly planning and ate obscene amounts of sugar and then we were supposed to do some service. I didn't feel particularly good about doing service because it wasn't fulfilling our purpose so I proposed the idea of ditching and biking to a neighborhood to get our 10 invites. Cutie K was all in. We strapped on our helmets, jumped on Sebasian and NoName (she hadn't named the bike yet) and headed out. 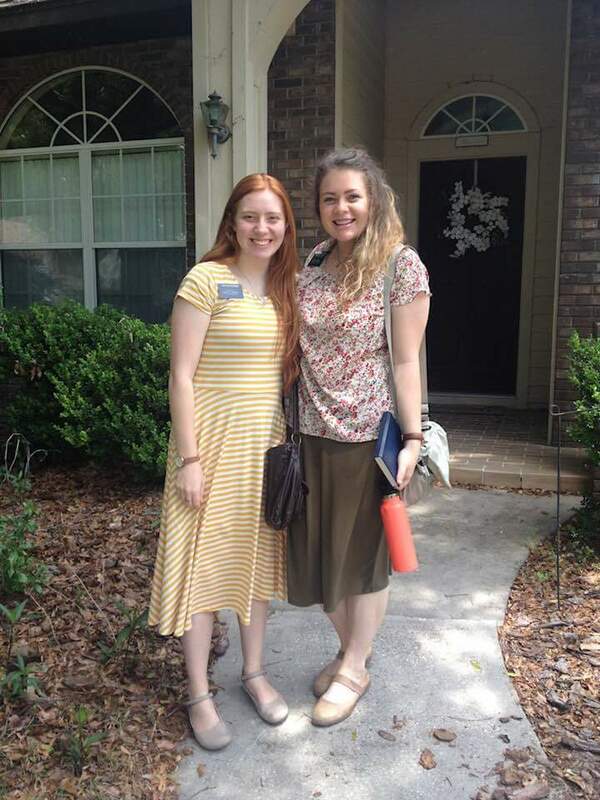 This was Sister K's first time riding her bike on her mission!! We arrived at the neighborhood we had planned, locked up our bikes and started knocking. We met some super nice people and invited EVERYBODY to come to church. We even found someone knew to teach!! We were killing it. As we walked away from a door Sister K says "um, is that the pole our bikes were locked to?" My response was something along the lines of "hahaha. No. No? Oh no...." We were sped-walked to that pole to find that some lovely bystander snipped our bike lock and took both bikes and Sister K's helmet (apparently something was wrong with my helmet because they left it...). We sat there for a minute, made some phone calls and eventually ended up on the phone with the police. There wasn't really anything they could do so we just went to our dinner appointment. And no, we didnt invite our 10 that day. Friday: WE INVITED 11!!!! We were very excited about that. Saturday: We were walking to that same neighborhood where our bikes were kidnapped and I saw something on the side of the road. Those punks had ditched my bike basket on the side of the road!!! You betcha I picked it up and carried it with me. Jokes on them though cause that basket made the whole bike! Sunday: We had 4 come to church of the 29 people we invited!!! What a blessing. I have gained such a testimony of hope and happiness in all things. President Gordon B. Hinkley said "those who go forward with a happy spirit will find that things always work out." I PROMISE THAT IS SO TRUE. It may not work out like we think it should but it will work out. I love y'all and I hope y'all have a STELLAR week. Posted on April 30, 2018 by Kevin Allgaier.